Hmmmm is it Emerald ..... in brown tonings????? I have a set of these. They have the same glaze as the greenstone dinner set I have. Good Griefness ..... I meant Greenstone!! Hee hee Well it was a precious stone you thought of Ev. Will keep my eyes peeled for the salt and pepper Narna. Down in Canterbury whenever we forget anything now , (which happens all the time recently) we blame it on post earthquake stress. Used to call it senior moments. Being on the trouble free side of Canterbury we thank our lucky stars every day now. just saw a condiment set like one pictured above on TM if anyone has been looking. Sorry, don't know how to copy and paste the listing number. ah, nothing like fresh fish for tea! Thelma, that Condiment Set box above that you posted .... does it itemize what is inside it? They usually do, but if not, what would you call the little pot please? Another question..... as the jug is vitrified, do you think all of these pieces are vitrified too? Tempting as it is to think the unknown shape is an egg cup, there is only ever one in a set. No lid to be seen in this one so maybe there is no lid. It's not a tooth pick holder or similar, is it? 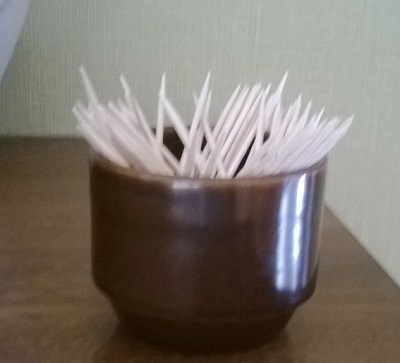 That's a great idea leish, as toothpick holders were popular in the 70's and 80's at least. I will try my one out and see what I think. 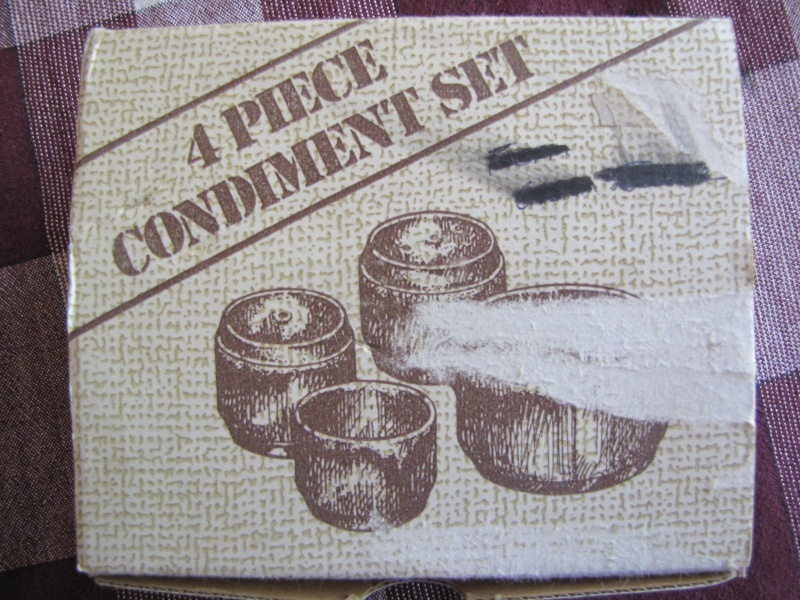 While I am packing boxes prior to moving, I found the condiment set above, and... it clearly reads on the side of the box,salt, pepper, sauce jug, mustard pot! So finally that one can be put to rest! Thanks Thelma, but now we will have to find another shape number for it. This should also form part of the discussion on hotel stacking, but I will sort that later. 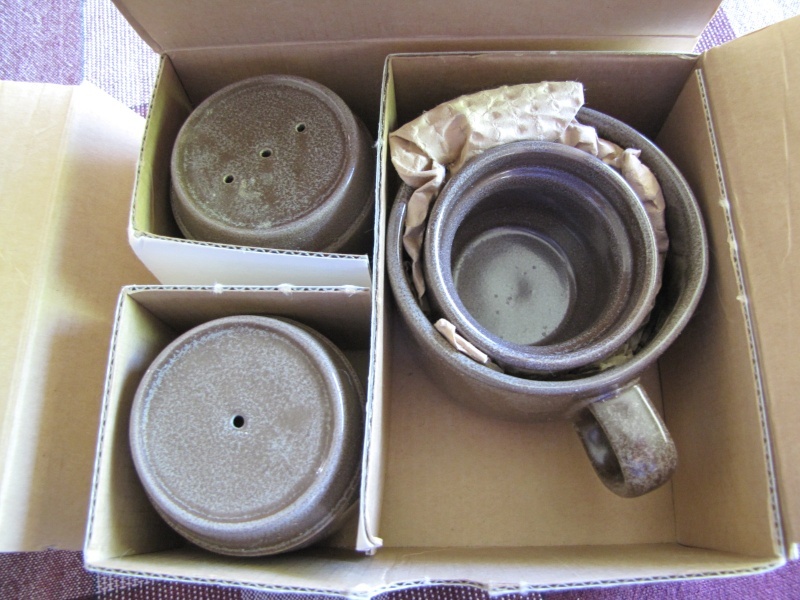 "The thinking was originally for two new cups, two new cream jugs, a sugar with lid and a pepper and salt. "To this request was added the egg cup and teapot to be produced at a later date ..."
A photograph of the teapot is shown: I don't know if that ever made it to market. In a photo of the various pieces the eggcup is just seen under one of the condiments. There is no mention of a mustard in the text. I believe that the shape later marketed as a mustard pot is the same eggcup shape, and that a search for a mustard shape number, different from the eggcup shape number, would be futile. I haven't sat down and read the whole book yet, but hope to have done so by the Exhibition opening.